On June 27th, a memorandum was signed between Fukuoka Prefecture and Hanoi City in Vietname, to further develop cooperation and friendship. 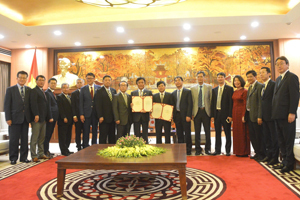 Since Fukuoka Prefecture and Hanoi City signed to further friendship ties in 2008, a wide range of exchanges have taken place in the environment, youth and economic sectors. Especially in the environmental sector, environmentally friendly waste disposal sites have been adopted "Fukuoka Style", with the aid of Fukuoka Prefecture technology. In the youth sector, high school student exchange students between countries and school excursions are increasing. This Memorandum of Understanding outlines our intention to promote new exchanges in the agricultural sector, including food safety and agricultural policies adopted through high-tech agricultural methods, to encourage agricultural development in Hanoi City.